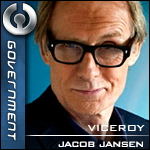 Viceroy Jacob Jansen is a male Hapan and the ruler of the Trade Federation. On Year 14 Day 103, he was elected Magistrate of the Galactic Concordiate (GC), the largest neutral alliance in the galaxy. Jacob Jansen's early life is veiled by a shroud of mystery that even the most probing security checks cannot penetrate. What little is known can only be gleaned from whispered rumors, some wild and fanciful. What is known for certain is that he was born on the planet Hapes, but Hapan Intelligence insists that census information on the Jansen family was lost more than a decade ago, leaving sparse records supplied by Jacob himself. At an early age, Jacob entered the Hapan Naval Academy where he studied galactic Naval tactics. HNA records show that Jacob was an excellent student, and that HNA officials looked forward eagerly to the day when his rising star would lead in the Hapan Navy. However, this was not to be. Although Hapan in origin, many have attested to the fact that Jacob is not very Hapan in his outlook. although most Hapans never leave the Hapes Cluster, Jacob wanted to strike out on his own and explore beyond the isolated Hapan borders. A loud disagreement with his commanding officer is the only blot on Jacob's record from the HNA, and it proved the motivation for Jacob to begin the pursuit of his desires. Resigning from the Academy, Jacob defied Hapan law and departed the Hapes Cluster, spending most of his savings for a small ship to make for the Galactic Core. The small and rickety ship Jacob had bought was not up for the long voyage to the core worlds, and Jacob was obliged to divert his journey to the Trade Federation's Glythe Sector. The Trade Federation long enjoyed a reputation for trustworthiness among the Hapan people, and Jacob traveled to Glythe seeking asylum and a chance to put his Hapan naval training to good use. Upon arriving on Vinsoth, Jacob quickly made his way to the the local recruitment office. All of his entry examinations were passed with extremely high scores, drawing the attention of recruitment commanders. Looking for an opportunity to explore Jacob's potential, Federation Command placed him in the 2nd Fleet under Kell Archis, where Jacob was given command of the Carrack/S-class Light Cruiser TFN Peacekeeper. His performance in the Department of Defense was outstanding and he quickly gained the trust of Archis who promoted Jacob to the rank of Tribune and Trias Territory Military Governor. The position of Military Governor gave Jacob his first true taste of command in the Trade Federation. In what was to become a feature of his tactical career, Tribune Jansen provided a strong defense system for the Trias Territory's small selection of star systems. The defense implementations at Trias gained Tribune Jansen significant support from Director of Defense Kell Archis, who recognized the value of the organizational mind under his command. In time, Director of Archis resigned his post and his Deputy, Centauri Tyridius assumed command of the Department of Defense. Throughout their long time working together, Tribune Jansen and Director Tyridius formed a strong friendship and remain today on the best of terms. It was clear to Tribune Jansen that if he wanted to further his career in the Trade Federation he would need to expand his experience and relations within the Confederacy of Independent Systems. Tribune Jansen applied for and was offered an open position running the Logistics Department at the Corporate Alliance. He requested and was granted an honorable discharge from the Trade Federation Navy to take up his new challenge in the Corporate Alliance. The Corporate Alliance was lead by President Garven Stalwart, a follower of Horley Cyan. Garven was a well respected man in the trade industry and Jansen was eager to learn much from him. However, the Corporate Alliance's Department of Logistics was at a crisis point, with chronic disorganization creating a logistic morass. Jansen quickly went to work, providing as much skill and discipline as he could muster to turn the department around. His experience with command at Trias served him well, and he grew into the challenge as the department blossomed under his care. Garven Stalwart was impressed with the skill and maturity of the young Jansen, and he promoted Jacob Vice President of Corporate Alliance. Moving in to a leadership role in the Alliance was a huge move for the new Vice President. Working closely together, the team of Stalwart and Jansen proved to be a great boon to the Corporate Alliance. Under their guidance, The Corporate Alliance regularly turned loss into profit. However, there were rumors that the Trade Federation had fallen on difficult times. Viceroy Horley Cyan stepped down and former Viceroy Corbin Esco had resumed his leadership position. Much was changing withing the Federation, and people with leadership experience were needed to stabilize the galaxy's largest trade conglomerate. Centauri Tyridius, who had risen to the position of Duceroy, asked Jansen to return to help the Federation. It was with much regret that Jacob decided to leave the Corporate Alliance, resigning his Vice President's post. On Jansen's return to Vinsoth, he met with Duceroy Tyridius, who offered him the job of running the newly-formed Ministry of the Interior. Jansen happily accepted, and was installed as Minister the following day. As Minister of the Interior, Jacob oversaw the Logistics Corps as well as the Department of Industry. This gave Jacob the ability to keep a close eye on all of the Trade Federation's facilities and cities throughout the entire Glythe Sector. This assignment was not a small task, but it was one Minister Jansen proved fully capable of handling. He spent a good amount of time as Minister working with Duceroy Tyridius and the Federation Cabinet. He remained a steady rock throughout the following political turmoil: the resignation of Viceroy Corbin Esco gave rise to a usurpation attempt by Darvock Tarion. The rise of Duceroy Bren Morgarr to Viceroy ended much of the internal political conflict, but left some holes in the CIS leadership structure. Throughout the political turmoil, Techno Union suffered due to a lack of real leadership. Minister Jansen recognized that Techno Union was a huge part of the Federation's future, and he volunteered to take temporary command. The vote was passed and Minister Jansen was appointed President of Techno Union. Jacob was given three simple tasks for his work in Techno Union: revitalize the membership the company, restore production and stabilize income. Over a short period of time, all these goals were completed and Jacob was now leading a significant competitor in the ship building industry. Sales were up, new shipyards were under construction and many new applicants made the organization a premier galactic employer. President Jansen had accomplished all but one task - finding his replacement. For this, he looked to a long-time and trusted friend, Krayt Fel. Krayt took over the leadership of Techno Union, clearing the way for Jansen to return to service in the Trade Federation. At this point, Duceroy Centauri Tyridius submitted his resignation, recommending Jansen as his replacement. The vote was taken to the Cabinet and Jacob was quickly approved as Duceroy of the Trade Federation. With the Trade Federation in economic boom, the Federation was pushed into the galactic spotlight. Having hundreds of millions of credits at the government's disposal, Duceroy Jansen was appointed Director of the Treasury and quickly started to build up an impressive naval fleet for the Federation. Adding many warships and haulers to the naval roster, the Trade Federation was finally able to take on large projects it never was able before. One of the most important additions to the Federation was the purchase of Starsign Shipyards from its owner and galactic trader, Syn. The purchase of Starsign gave the Trade Federation exclusive rights to produce the YT-510 and rights to both the YV-666 and YT-2400. Not too long into his tenure as Duceroy, Jansen experienced firsthand command issues that were not getting addressed by the Viceroy Morgarr. The Trade Federation had continued an extended war with the Galactic Empire, which hurt the Federation's economic standing and made adequate defense of Federation territory impossible. Duceroy Jansen quickly lost confidence in Viceroy Morgarr's inability to take advantage of opportunities for the Federation on a galactic level. He felt that if something was not done quickly, the Trade Federation would spiral down an irreversible path, squandering opportunities for continued galactic prominence. Acting on his own, Duceroy Jansen spoke with the Cabinet looking for support to approach Viceroy Morgarr about his resignation. To his surprise, there was little resistance and every member of the Cabinet vowed their support to Jacob. The plan was to get a quick and harmless transition of power. Fearing the spectre of past political turmoil when Viceroy Morgarr came to power, Duceroy Jansen wanted to avoid a coup or civil war that would cause huge harm to the Trade Federation. Because of the delicacy of the situation, very few members were told of the quiet push for a transition of power. A few days later, Duceroy Jansen respectfully approached Viceroy Morgarr, asking for his resignation. The Cabinet was invited into the discussion and almost immediately Viceroy Morgarr resigned his command of the Trade Federation. On Year 8 Day 333, Duceroy Jansen was appointed Viceroy of the Trade Federation. Viceroy Jansen quickly implemented what some would call harsh but completely necessary changes in the Trade Federation and the Confederacy of Independent Systems. One of those changes was to end the war with the Galactic Empire. Viceroy Jansen long felt the war was a huge mistake for the Trade Federation. The founding goals and principles of the Federation were being ignored because of a simple misunderstanding between the two powerful governments. Knowing this, Jacob contacted the Emperor and brokered a cease-fire between the two polities. Renewed commerce started to flow between the two governments, allowing a foundation for future relations to flourish. This cease-fire with the Empire opened diplomatic channels with both the Hapes Consortium and Mandalore. Both of whom where member states of the Imperial Union and allies of the Empire. After peace was secured with the Empire, it was a natural step to move towards the Imperial Union. Jacob was approached by the Emperor and they both discussed possible future cooperation between the two governments. The decision would prove difficult for the new Viceroy, since never in the past had the Trade Federation been involved with the Galactic Civil War. Joining the Union would surely push the Federation to the Imperial side and cause political issues with the New Republic and their allies. The decision was taken to the Cabinet where it was discussed for a many months. When the Cabinet was in agreement it was taken to the Confederate Senate and then to the Trade Federation Directorate. With unanimous support and approval, Jacob opened discussions with the Imperial Union heads of state. After a few short discussions the Union approved the Trade Federation’s request for membership and on Year 9, Day 295 Jacob announced to the universe the good news in a live speech over the holonet. At a secluded meeting with Sith Lord Azrakh Raleep about Sith possibilities within the Trade Federation, Lord Raleep detected the ability to use the force within Viceroy Jansen. This was not a total surprise, as Jacob always felt he had an advantage over most people. He was always able to run a little faster and jump a little higher - the ability to always be ahead of the game. Some would say pure luck, but it was something far more powerful. After a brief time with Lord Raleep, Viceroy Jansen traveled to meet with Emperor Vodo Bonias on his Super Star Destroyer where he trained in the powers of the Sith. There Jansen met Darth Malius, who served as his Master. The force was strong with Jansen and he quickly learned the ways of the Sith. When his training was complete Jansen left not only as a Viceroy, but a Sith Lord and member of the Sith Order. Returning to the Trade Federation, Viceroy Jansen planned on using his new-found powers to better the Federation and its people, hoping to find more force users within the Trade Federation to act as its supreme guardians and enforcers. On Viceroy Jansen's return to the Trade Federation, he discovered the force within his Minister of Defense, Kage Renbukai. Viceroy Jansen took Kage as his apprentice, teaching Kage the ways of the force. Kage quickly reached the title of Knight. It was not too long before another member of the Trade Federation was found to have the force. 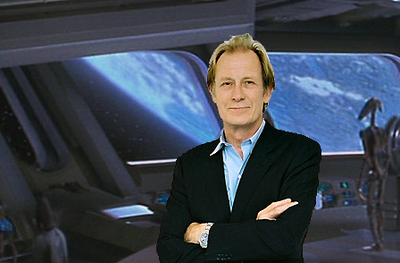 Olwin Froon, Director of Naval Production and leader of the Techno Union became Viceroy Jansen's second apprentice and quickly learned the ways of the force. It was then that Viceroy Jansen, Kage and Froon formed the Evocati Order and themselves served as the Inner Circle of the Order. The Evocati were designed to serve as the force guardians of the Trade Federation. The Order's mission is to serve the Trade Federation and to search its members for those special enough to have the ability to use the force. Since its creation, many members of the Trade Federation have joined its ranks. The Order stands as one of the most secretive divisions of the Trade Federation. For a good deal of time, no one outside of the Order even knew of its existence. Even today, very little information is known about the Order and its members. Following months of talks and weeks of non-stop fine tuning, in Year 11 Viceroy Jansen signed the Trade Federation/Hapes Consortium Alliance with King Jessy James, ruler of the Hapes Consortium. The signing took place in the Stenness Node's Aweris System. Known as the Neshig Accords, the alliance was the first of its kind for both governments: a no-strings-attached militaristic, economic, and social alliance between the two powers. Viceroy Jacob Jansen grew very powerful in the Dark Side of the Force. His influence within the Sith Order grew such that, when the reign of Emperor Vodo Bonias ended, Jacob was asked to serve as one of four members on the Sith Council under the new Dark Lord of the Sith, Master Volentus. The position on the Council came with a promotion to Darth and a new name, Darth Triaris. Darth Triaris’ time in the Sith Council was short. Tensions arose between the Dark Lord of the Sith and Darth Triaris. Darth Triaris decided to pull out of the Sith Council and the Order to ensure no harm would come to relations between the Trade Federation and the Galactic Empire. Keeping his title, Darth Triaris strictly serves within the Inner Circle of the Evocati Order. With new leadership of the Empire came a new direction put upon the Imperial Union heads of state. The Empire wanted to reform the Union into a military coalition and wage war on the Galactic Alliance. This naturally divided the member states, many of whom did not wish to directly engage in war. The Trade Federation was on the side of peace. With drastic changes presented to Union heads of state, Jacob took the rare opportunity to move the Federation back on its original path of neutrality. After getting unanimous approval from the Cabinet, Jacob in turn spoke with the Empire and the remaining Union leaders. On hearing the Federation's plans, all remaining member states aside from the Empire decided to follow Jacob's example, withdraw from the Union, and declare neutrality. Jacob officially declared the Trade Federation's neutrality on Year 13 Day 315 in a public GNS titled "Honor, Integrity, and Profit." Leaving on peaceful terms with the Empire, Jacob quickly went to work with his Cabinet. For weeks they drafted up plans and ideas. The first of them was launched on Year 14 Day 52 in a GNS titled "Trade Federation Viceroy Aims To Strengthen Trading Community." The GNS was an announcement of the new Trade Federation Citizen Program, a program designed to recognize honorable traders of the galaxy by offering the support of the powerful economic engine of the Trade Federation. The program grants citizen status to galactic residents who fit the higher standards set to traders by the Trade Federation. The program instantly became a huge success. Many traders and entrepreneurs of the galaxy applied for membership. The Citizen Approval Board, composed of select Federation members, was quickly overloaded with applications and newly approved citizens have flooded Federation commerce centers throughout the galaxy. This page was last edited on 15 January 2015, at 23:49.